Give your child the building blocks to spelling with this fun worksheet. Cut and paste letters to form simple words, focusing on beginning and ending sounds. Animal loving kids will jump at the chance to take a trip to the zoo with this ending sound worksheet. This maze has a twist! To get to the end, draw a line through the words ending in "-ing". Your little reader will get to know the word family ING as he goes. Cut out the letters and paste them on the correct spots to spell out the words. Use the cute pictures as a guide to help your reception reader learn to spell. Does your preschooler know her word families? Introduce her to the "ay" family with this fun and simple word maze! Here's a fun way to get to know the word family AN! Draw a line through the pictures that end in "-an". Don't be puzzled by sight words! Work your way through this maze to learn some new words and rhymes. Students will learn to listen closely for ending sounds as they complete these words one square at a time! 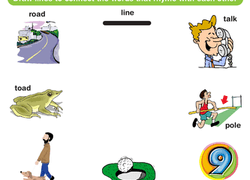 This rhyming worksheet will boost your child's pre-reading skills by having him connect similar-sounding words. It's time to rhyme! Has your beginning reader mastered his word families? Challenge him with a fun picture maze, where he'll draw a line through the pictures that end in "oat". Advancing phonological awareness is fun for young students with this worksheet as they think about some ending sounds for things found in the city! Can your student figure out which ones don’t belong by finding the pictures with the same ending sound? This isn't your average maze -- this one is filled with words! Let your preschooler practise recognizing the "ish" word family as he completes this maze. Start phonics practise with a fun picture maze! Draw a line through the pictures that ends with "-ool".